Attention has already been called to the characteristic flatness of the aerial view. Neither the picture on the retina nor that on the photographic plate affords any adequate idea of hills and" hollows. Unless shadows are well defined, small local elevations and depressions cannot be distinguished from mere difference in color or marking. Even in the presence of shadows it is often only by close study that differences of contour are noticeable. But with stereoscopic views these features stand out in a striking manner. 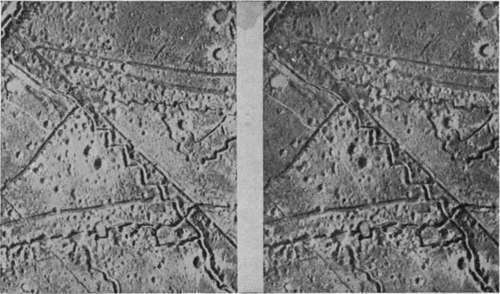 Taking our illustrations from military sources, we may note the use of stereoscopic pictures to detect undulations of ground in front of trenches (Fig. 161). They reveal the hillocks, pits, small quarries, streams flowing behind high banks, and other features which make the attack hard or easy. Commanding positions are shown, the boundaries of areas exposed to machine-gun fire, and the defilades where the attackers may pause to reform. Concrete "pill boxes" are located in the midst of shell holes of the same size and outline, and can be differentiated from them. Railway or road embankments and cuts can be detected and studied to extraordinary advantage in stereoscopic pictures. Thus what appears to be a mine crater on a level road, easily driven around, may be a gap blown in an embankment, a serious obstacle indeed. Bridges, observation towers and other elevated structures jump into view in the stereoscope when often they have entirely eluded notice in the ordinary flat picture. Once presented in relief, camouflaged buildings or gun emplacements, however carefully painted, are ridiculously easy to pick out. Fig. 161. - Typical stereogram of military detail. Fuse by looking at a distant object over the top of the page, and quickly dropping the eyes to the print. Practical peace-time applications of stereoscopic views . can easily be foreseen following the lines of war experience. Such, for instance, would be the study of proposed railway or canal routes. A series of stereograms would obviate the necessity of contour surveys, at least until the exact route was picked and construction work ready to start. Apart from their utilitarian side, however, stereoscopic views have very great pictorial merit. Stereoscopic pictures of cathedrals, public and other large buildings, have often great beauty, and afford opportunities for the study of form given by no other kind of representation, short of expensive scale models. They may very well lead in the near future to a revival of the popularity of the stereoscope.